A few weeks ago, I made chicken rollatini’s with prosciutto and cheese, and while my family was asking for me to make them again, I decided to make Chicken Rollatini with Pesto and Mozzarella instead. A recipe from my sister Liz! 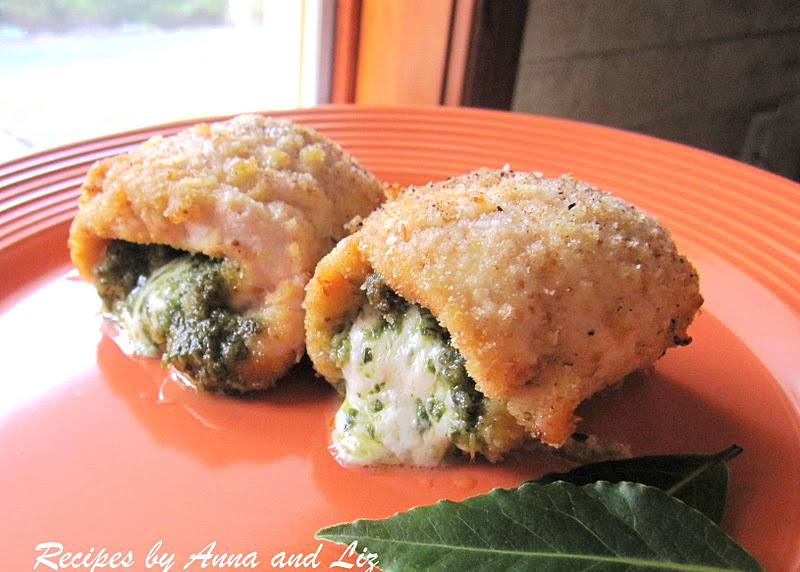 These chicken rollatini’s are made with thin chicken cutlets filled with pesto sauce and fresh mozzarella cheese then rolled and baked for 20 minutes. Moist, tender and very tasty, chicken rollatini with pesto and mozzarella is a terrific dish to serve with a green salad and some roasted vegetables to complete the meal. My sister Liz enjoys creating all kinds of dishes, and she’s great at that! She decided to create a different rollatini and the result was terrific! Giving this chicken the ‘wow’ effect! The taste was even better than she thought. Chicken rollatini is an easy recipe and one you can make in less than 15 minutes. You have to try this recipe to believe it. To help me save time, I decided to buy the already made “all natural” pesto sauce. No need to salt the cutlets, the pesto sauce provides enough salt; it’s mixed with grated cheese, olive oil and other seasonings as well. It’s a great recipe for hectic weeknights and busy Moms like me! Try them! In a small dish, add the olive oil for dipping. In another plate, add the plain bread crumbs. Take each chicken cutlet and dip into the oil on both sides, then gently dip into the bread crumbs. Gently coat both sides with bread crumbs. Lay them flat onto a plate. Spread One Tablespoon of Pesto Sauce onto each cutlet. Cut a small piece of mozzarella and place in the center of each cutlet. Roll up the cutlet. No need to use toothpicks to secure, just place them with seam side facing down onto a baking dish. Spray lightly with olive oil on top of each cutlet. Sprinkle fresh pepper and garlic powder onto each cutlet. Bake at 400 degrees for 20 to 25 minutes (depending how thick the cutlets are) Serve. Roasting Pumpkin Seeds How to Clean Artichokes? I made this dish for dinner and my husband absolutely loved it! It was super easy to make. Thanks Anna and Liz! Looks amazing, Im inspired for tomorrows dinner!!! Thanks so much! My husband and I loved this dish! He is a picky eater and I often worry about if he will like foods "with flavor" The pesto goes great with the chicken and breading, this dish is a definite make again and again. Liz, I know the peas are not up yet but I am making them AGAIN! Thanks so much for your recipes they are great! Perfect recipe for chicken – always looking for more – thanks! These look so good! Gotta love quick and easy chicken recipes 🙂 And stuffing them with pesto and mozzarella was a wonderful idea!!! My family loved it. So, being a non-meat eater tried it with fillet of sole instead of chicken. YUM! Fish stays very moist. Same recipe otherwise, except the fish cooks a bit faster. Also found the cooked chicken rollatini freezes and reheats well. I even made extra and and froze some the fish version -but I refroze the sole rollatinis using FRESH, UNCOOKED fish. Perfect for a quick meal. What a delicious idea! Haven't tried it yet with fish, but I bet it is just as yummy as you say it is! Thanks for a great tip!